Here are just some of the wonderful things that people have said. 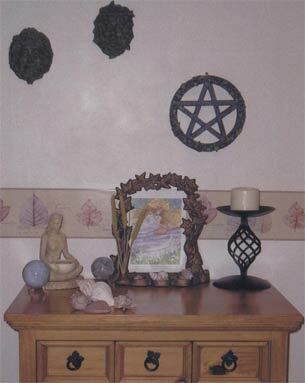 Thank you Greet for this lovely photo of your Goddess altar. I just wanted to inform you that my order has arrived today, safe and sound, and the cards I purchased are beyond beautiful: such marvelous detail! So, again, thank you for your wonderful art and for sharing it. Your book is even more beautiful than I could have imagined. Absolutely stunning. A real story to be read and told. I am sorry I never found your book before now. Thank you again.. I can’t stop looking through it, it’s magic! My order arrived yesterday. I was sooooooo happy. Awesome art work 🙏🏻 I love the wheel and my friends will love their wheels too. Thank you so much. Be blessed. 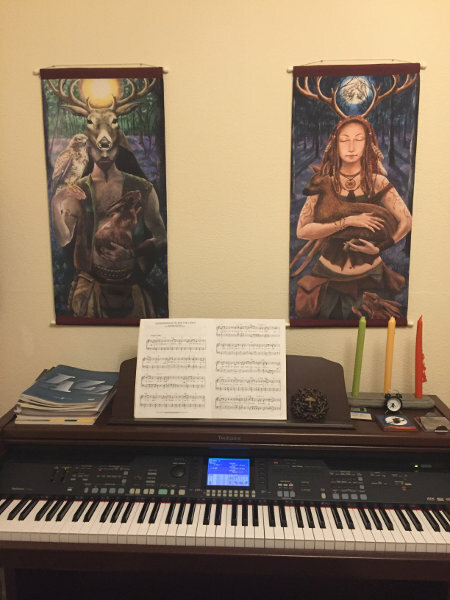 Many thanks to Noro for this stunning photo of his Lord and Lady of the Wildwood wall hangings! Thanks Yolanda for this lovely photo. Just wanted to say how beautiful your book "Luna Moon Hare" is. What a gift you have! Your paintings are enchanting, they show how much pleasure can be had from nature and the myths that help us to enjoy the seasons and festivals, your magical and skilful interpretations of the natural world are so beguiling. 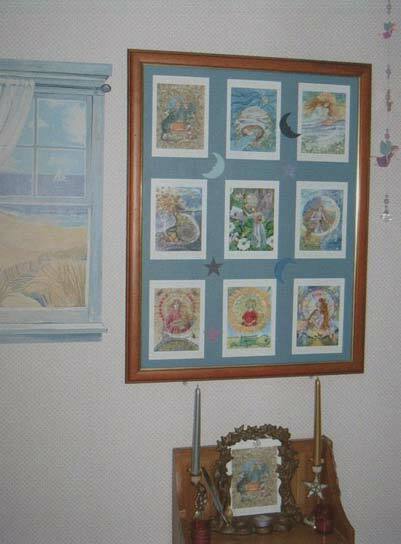 I shall certainly treasure "Luna Moon Hare" - and the "Dreaming of Spring" card which I love. 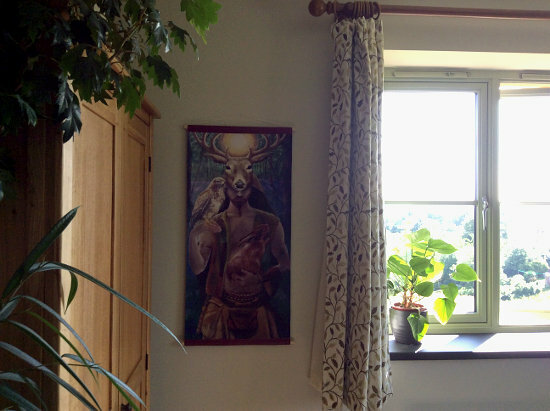 Hi just a quick email to say how pleased we are with the wall hangings of Lord and Lady of the Wildwood. I bought them as Yule presents for myself and my husband. Many thanks, Cathy and Dave Belford. I have almost finished reading your book Luna Moon Hare and felt that I must write and tell you what a lovely book it is. The illustrations are amazing, I have never enjoyed reading a book as much as I am this one for a long while. The book is truly wonderful and will always be treasured. The Wall Hanging arrived today. Thank you very much, it is very lovely. And already on my wall :-) as you can see on the photo I included. I am sure I will order more of your beautiful Wall Hangings. Just wanted to say the book arrived today and certainly didn't dissapoint. The illustrations are absolutly gorgeous, what a talent you have, and thank you for the inscription, a lovley touch. Your book is really really lovely - a book to treasure forever. Thank you for my fabulous CD, I loved it! My son who is 11 has also listened and enjoyed it. It was very relaxing and truly wonderful to be taken on such a fantastic journey with the Luna Hares. 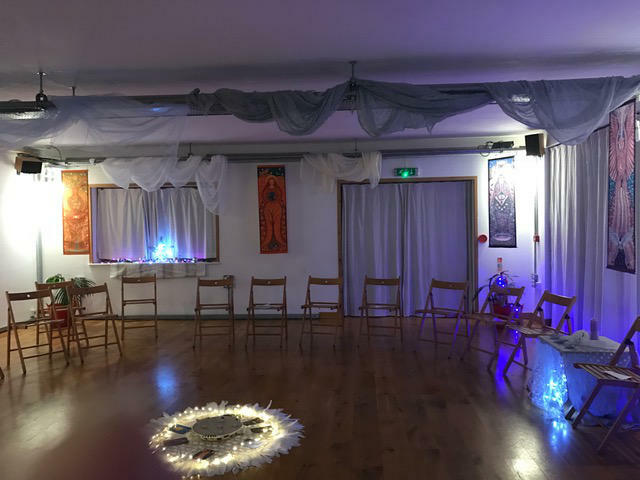 Thanks Michele for sharing this photo of the sacred space created for a Yule ceremony with Goddess banners on the walls!...beautiful! 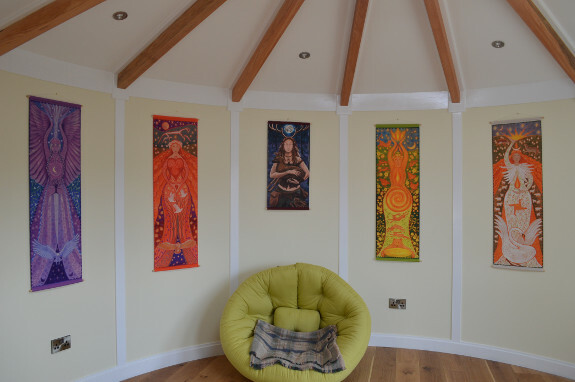 Thanks Jan for these lovely photos showing her Goddess wall hangings in her cedar roundhouse. Wonderful! Just to thank you for the beautiful inspirations you share with us. This picture is in my sanctuary or sacred space. It's actually a BBQ hut, but with a solar pipe instead of the grill. I have 5 of your hangings , one in each of the quarters, plus the crone. I also have some of your prints there, Nuit, Sige and Andraste. This is my place of worship, contemplation and workings. The shape of the hut with your beautiful designs support me and provide me with everything I need. The hut was a gift to me on my retirement , I know I am so very lucky. The picture doesn't do justice to your work, but I hope it reflects how much it is loved and valued. Thank you. 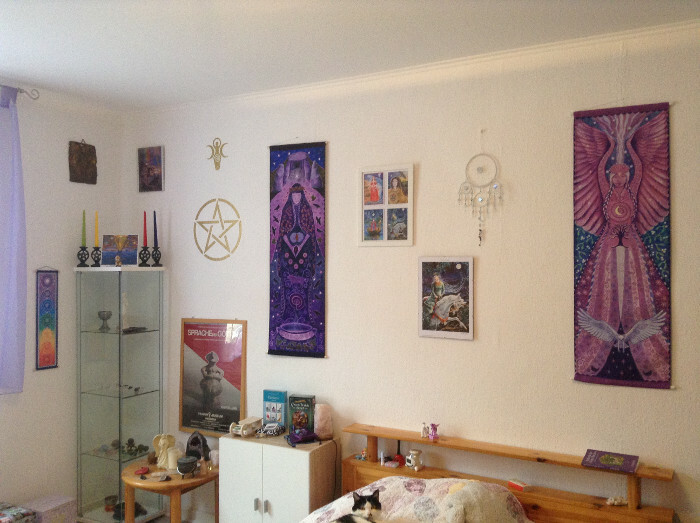 I have just received the wall hanging with the Crone goddess, it is even more beautiful than I had thought! Thank you so much for making it! I am very moved by her new presence in my home and I will enjoy her very very much. I just want to take a moment to send you my heart-felt THANKS for a signed copy of your amazing Luna Moon Hare book. 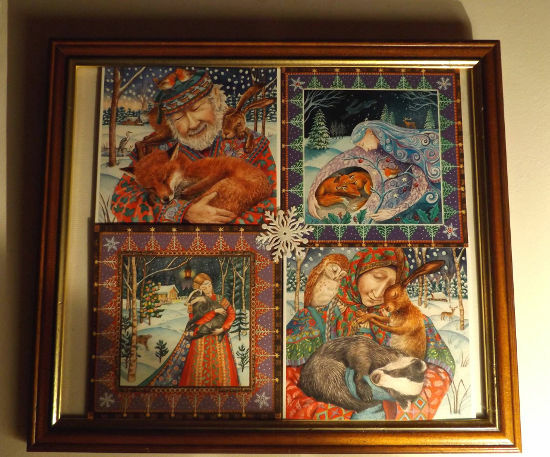 It arrived safe and sound along with the beautiful yule card set a few days after you had dispatched it. While I find the cards truly amazing, I think the book is pure magic! I read it in one take after a particularly exhausting day, and it brought me right back to earth with its wonderful imagery and beautiful story-telling. My copy of Luna Moon Hare arrived today. Thank you for despatching it so promptly. Although I have seen reviews of the book and examples of your wonderful artwork, I am absolutely enchanted by this book. The way the story journeys through the season is just perfect and the art is entrancing. I am so looking forward to sharing it with my granddaughter when she is a little older but, in the meantime, I intend to guard jealously and read it often! A spectacular Calendar with the most exquisite artwork. It has everything in it that a Pagan could wish for. It gives you all the main Festivals of the year and also the phases of the Moon. Thankyou so much for the beautiful calendar. I love it! Your paintings help me to feel calm and peaceful and remember that we are part of everything! Thank you wendy, The cards arrived quickly, its great that you are so reliable. I really appreciate that. They are absolutely lovely, without fail you create enchanting magical images, I will send them to a few special people. My lovely friend gave me the goddess wheel last Yule,and I shall treasure it always, the sense of wisdom calms and empowers at the same time. I received my cards yesterday (super quick),many thanks for that! I have got to say that your paintings are absolutely beautiful, even more so in real life, I absolutely love British wildlife and feel all our animals are much maligned and persecuted and you have such empathy with these beautiful creatures, they deserve so much more and it really shows in your lovely paintings, I will treasure them, and be very proud to buy some lovely frames to hang them in. Everything is arrived. Oh Wendy, I have no words to explain how I am impressed by your art. I don't know what magic you do, but it's like you can reach exactly what I feel and give it shapes and colours. Just in case...do you have any of the original available of your new paintings? Of the calendar or any other? I just wanted to drop you a line to say thank you for our beautiful wall hanging. It is the first thing I gaze upon in the mornings which is very grounding before I shoot off into the crazy world. It has given us so much enjoyment and I just wanted to let you know how much your work is admired. That delivery was amazingly fast. I had the book and card the next day! The particular painting of 'The Lord of the Wildwood' is my favourite portrayal of the god in any form. You have captured so many elements of him; strong, protective, caring and nurturing. and rather 'other' than a muscly human. I had one of these before but gave it to my niece to put on her altar. I think we shall both want the wall-hanging eventually. The book is stunning. The story is a joy to read. Excellent for children, but also to meditate onl. I am particularly fond of your line ...'She stretches out her arm and makes it a path to forever...' The illustrations, of course, all all evocative of the Goddess and the turning of the year. 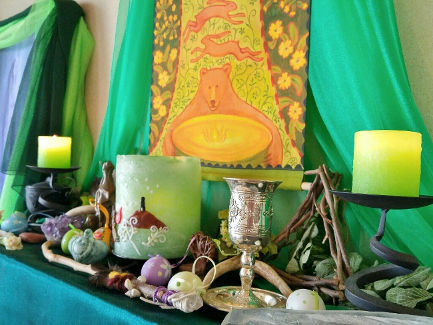 My particular favourite is Imbolc, with the glorious Brigid. As you can tell, I am very pleased with my purchase. Long may you brighten the world and inform others about the Goddess with your works of art. Thank you so much for the fast delivery of the book, this one is a gift for someone and I hope she loves it as much as I love my own copy. Your book is so beautiful, both the pictures and the words, I found it so reassuring during a difficult time. Wishing you a wonderful and creative 2014, thank you again for your magical book. With very best wishes, Sarah. 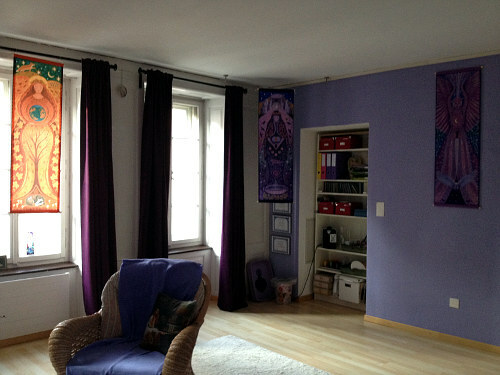 Goddess fabric hangings in the classroom of the Goddess temple in Winterthur Switzerland. Thankyou so much for sending me the cards so quickly. They are absolutely stunning and I know the friends and family who will receive them be enchanted by their ethereal beauty, as was I. Your work brings out a deep rooted emotion, a connection to Mother Earth that I sometimes feel I have not lost but miss in the hectic day to day routine of everyday life. Giving these cards to others I hope will share this connection and they will look upon them and feel the love and beauty in your work. I apologise for not having sent this sooner but time seems to have evaporated. I just wanted to say thank you so much for getting my order out so quickly. I received it within 24 hours which was lovely. Everything was in top shape and the calendars are so beautiful as there is so much to see in them. I may have great difficulty parting with some of them for Christmas presents! So once again thank you. I just wanted to thank-you for sending the wall hangings so quickly after you returned from your holiday - they arrived safely and the packaging was superb. Thank-you also for the lovely card that you sent too - it was very much appreciated. 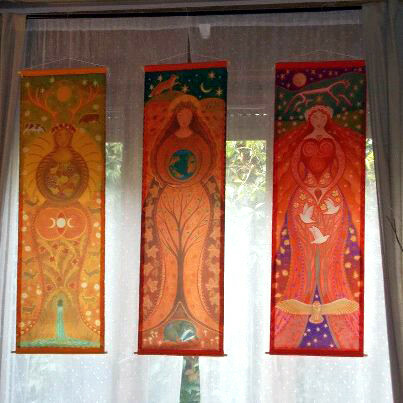 The Goddess wall hangings are really beautiful and I'm amazed at the detail contained within each one of them. They each capture the energy and the sacredness of the Goddess in their own unique way. My copy of Luna Moon Hare arrived this morning. It is a most beautiful book, which made me cry when I looked through it. The images are wonderful. Thank you. I learned about you when a friend gave me a Yule card, which I still have on display because I love it too much to put it away. Then I decided to buy some cards, but couldn't make up my mind which. The book will keep me happy. I just wanted to say thank you so much for my package, which arrived this morning as promised. Everything was so well wrapped and arrived safely. Thank you too for the hand written card, that personal touch is and was much appreciated. I was not expecting the Luna Moon Hare book to be signed, as again, thank you for such a personal touch. This is the second copy I have bought, the first was for my niece, and I loved it so much that I had to get another one for myself. The print of Luna with the swan is even more lovely than the image in the book, if that's possible, and I look forward to getting it framed and hung at the earliest opportunity. I look forward to having some time later to listen to the CD and I hope that the Yule Hugs cards will result in smiles on the recipients' faces at Christmas. I have no doubt that I'll be back for more cards throughout the year - so I look forward to speaking to you in the future. Thankyou so much for creating such a beautiful website - and for sharing your vision - I'm finding it a truly inspiring experience! 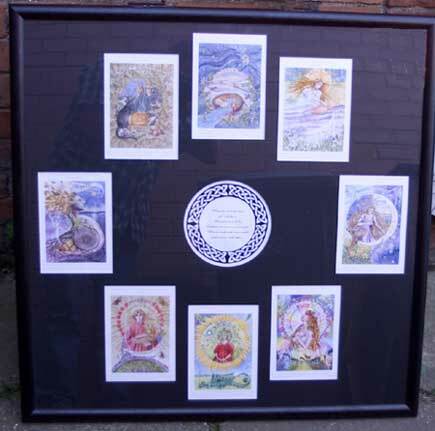 Today I received your exquisite Love Goddess wall hanging, the Goddess Wheel and the lunar calendar carefully packaged and made personal by your thoughtful handwritten cards - a real treat, and one which is blossoming..! 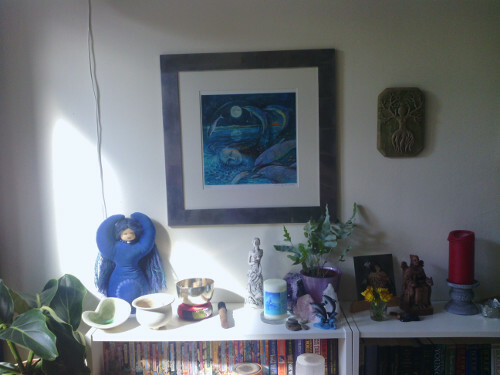 My Earth Goddess wall hanging found her way to me today and she is absolutely gorgeous. You can tell how much love and attention went into the painting. She was also wrapped up perfectly. The piece is stunning and will be treasured y my entire family. I also love the Luna Moon Hare card you sent with the package. So adorable. My kids and I read Luna Moon Hare every time the wheel turns. We love looking at the pictures together. I am looking forward to all of my future purchases! Thank you for sharing your creativity with us. 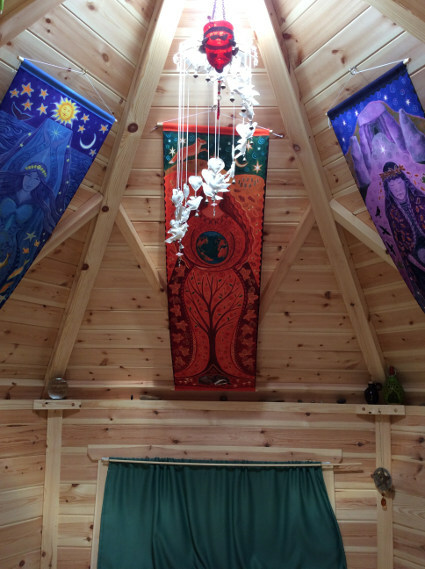 Many thanks to Laura for sharing this lovely photo of her Goddess hangings at her wedding! Wonderful! 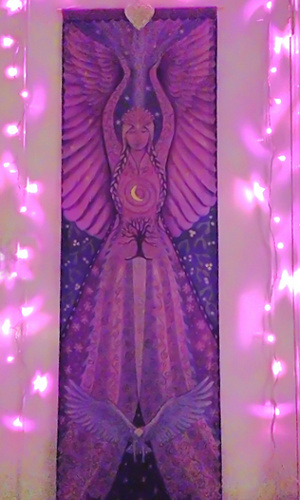 Sandra's Air Goddess fabric hanging looking beautiful with pretty faerie lights! I really do appreciate the personally written card you sent along with my order, it will be going into a frame when I find the right one for it. I am always so very chuffed with anything I order from you, it is such a pleasure to have your stunning creations in my home. Thank you for your newsletters too. The wonderful cards I ordered have arrived today and they are even more beautiful & amazing than they look on the website. Thanks for the speedy delivery, much appreciated. Received my CD yesterday and have just listened and enjoyed it sooo much, thank you for creating such a beautiful meditation. Thank you for the beautiful cd. An absolute treasure. I just wanted to say that the book has arrived all safe and sounds, and thank you so much for the beautiful card - I will pass it on to the parents so that they can keep it for her. I sincerely hope that she will enjoy it and treasure it, as I treasure my copy. 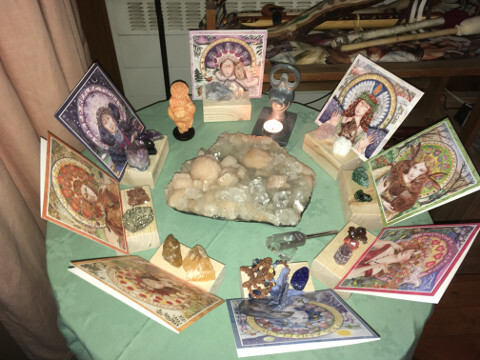 I am sure that you hear this often, but I absolutely love your work, I find it so inspirational - especially your Goddess Wheel. Thank you again for sending me the book so quickly. This evening, despite being unable to manage a quiet moment with my headphones, feelings of stress drew me back to your beautiful merging of voice & music , and i decided to listen to the CD letting it fill the room for the first time. It was wondrous, so very soothing and refreshing for mind, body & spirit...i listened to it four or five times in succession, immersing myself fully in the flow of healing energies. Thank you once again for this exceptionally restorative experience. I have just completed the Sacred Pouch journey with Luna Moon Hare to meet The Goddess. 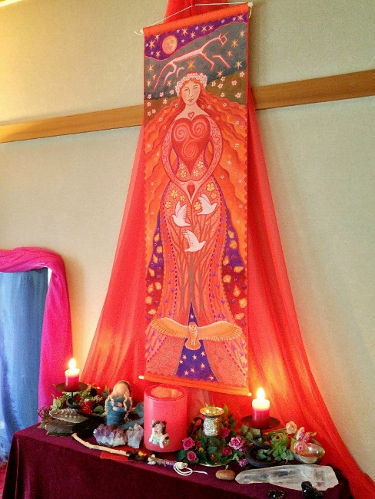 Meeting each aspect of the Goddess was a joy and their gifts real treasures. Thank You... More Than Words Can Say, for a Beautifully Crafted guided journey I will treasure anew each time I make it. Having ordered a copy of the "Sacred Pouch" CD as soon as you announced it was available, and receiving it so swiftly, i wanted to send you my heartfelt thanks for a truly uplifting experience when i sat down to listen to it for the first time last night. From the outset, with the exquisite intermingling of voice and music, i was drawn into the magic of past, present & future so smoothly and easily, and able to immediately enter the flow of images evoked by your word-pictures. The ensuing visual and spiritual journey led to an extraordinarily mystical encounter, and one which i may return to and re-enter at any time or season, when in need of inner refreshment and healing. 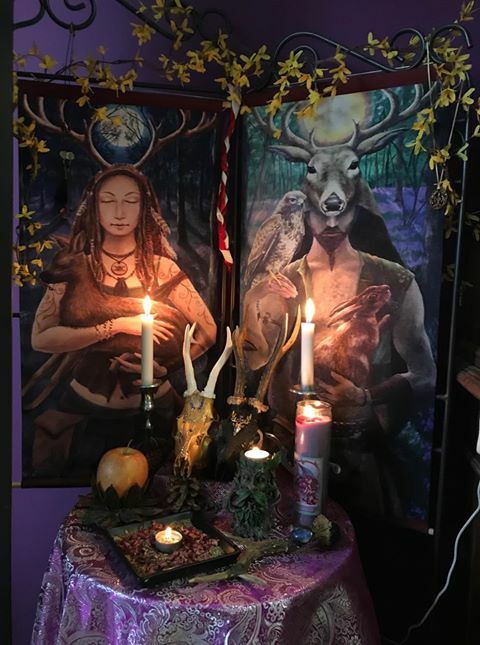 just wanted to say a big thank you for the beautiful Fire goddess hanging. it is truly stunning. I am amazed at how quickly it came!! 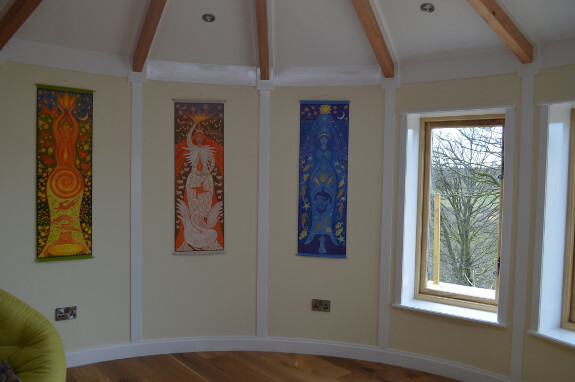 I purchased the Sacred creatures calender whilst i was in Glastonbury and was thrilled to see you have a website. You are a very talented lady. 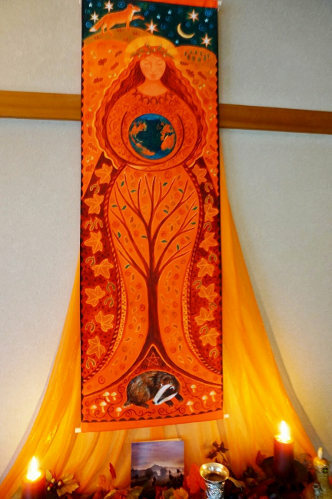 My hope is that over time i can collect all of the wall hangings to create a sanctuary of peace at my home. They are inspirational. Many thanks and all the best for 2012. So quickly. All has arrived, beautifully wrapped and in top condition. I am totally thrilled with them all and that you sent me a card and signed the book! I am busy writing some of the cards now. I just wanted to let you know that the prints arrived safe and sound today and I am so pleased with them. For a long, long time I've been looking for, what for me, would be the perfect representation of the Horned God. Thanks to you, I've finally found him !!! Thank you so very, very much. Also, another big thank you for your amazing book Luna Moon Hare. It's one of my most treasured books ever. I never thought I'd one day actually get the opportunity to tell you just how much I love it. There are no words to describe how moving and beautiful it is. Now I've found your website I shall be a frequent visitor. The calendar is wonderful, the pictures are lovely and it's just full of your passion, love and energy I love it and can't wait until the new year lol! I have just received my copy of your new 'Goddess Calendar'. I was thrilled it is as beautiful as I expected it would be. As the proud owner of 'Luna Moon Hare' I had high expectations and was not disappointed. I am so drawn to the beauty of your paintings they have an ethereal quality and I am mesmerized every time I look at them. They take you in and lead you on a journey to your inner self. Pure meditation in a picture. Really I don't have the words to fully describe how they make me feel but the closest I can come to it is that they fill me with wonder. Never stop painting it is part of your soul and journey and gives more pleasure than you will ever know. My personal favourite is Hare Dreaming (I love your depiction of beautiful Hare) closely followed by Gaia's Winter Rest but of course they are all so beautiful! Thank you so much for the Goddess Wheel (of the year, of life). It is such a wonderful idea, and the art work is beautiful. My wife loves it and could not image anything better. Moreover, my wife said the painting of Bridget was the best image ever that she has seen. Also, you packed the Wheel in a secure way, and it arrived here in perfect shape. I appreciate that. And also, another 'also', you included such a lovely card, with your thanks and blessings. How thoughtful. We are so pleased and happy with your work. I suspect we will give another look at your web site. 'Luna Moon Hare' is both Wonderfully inspired and beautifully crafted...A truly Magical Journey through the Seasons Thank you for sharing your Gift with the World. I look forward to reading this book to my Grandson when he is a little older, it is so important that these old wisdoms are passed down to future generations and the symbolism in your paintings speak volumes that words alone can only struggle to convey. I do hope that you are inspired to produce more books like this in the future, as this gifted combination of words and art work not only provide much pleasure (your cards also!) they help to Awaken the true Spirit of both this Beautiful Land and it's inhabitants. The Moon Calender i ordered from you yesterday teatime has already arrived this lunchtime! It is so beautiful and thankyou for the Winter Solstice card too!! 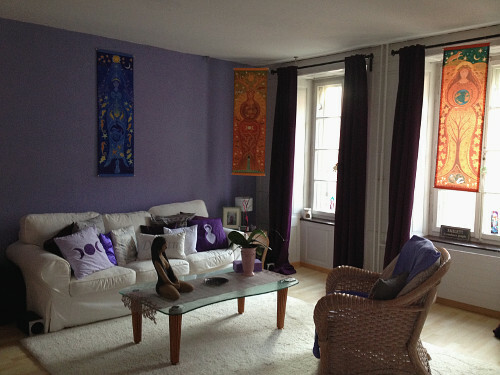 I received the wall hanging and the pictures yesterday. I just wanted to say how pleased I am with them. The wall hanging is absolutely gorgeous and is now proudly hanging on my bedroom door. The pictures are so beautiful and I intend to put them into frames and hang them round the house. I love your art work so much and it incorporates everything that I love about nature, animals and the goddess. Both my daughters, aged 5 and 1 love your work also and we've been studying your wall hanging and deciding between us which bit we like the best! Hi Wendy, thank you for the quickness of your service. We received the book and cards yesterday and also your personally written card. They are all beautiful, the cards, the book and everything. Im finding it hard to describe how emotional it has made me in a good way though! The book is perfect for teaching my 6 year old the turning of the wheel and how the seasons and the earth work together and how the hare is the perfect medium to be understood by all ages. Again, thank you and I'm sure I'll be back for more and will definitely recommend it to others in our group whom have children the same age as mine Im sure they will love it too. Keep doing what your doing because its working! I just wanted to thank you for the totally gorgeous Luna Moon Hare Calendar, which arrived safely yesterday. I can’t wait till January to be able to hang it up! Just to say how much I loved your 'Ever changing nature of the Goddess' set. Also your painting of the Lord is just how I see Him & your depiction of the Triple Goddess is wonderful. You have an incredible talent! Thank you so much for the speedy delivery of my order and for the personal card included. What a lovely gesture. The cards are really beautiful and to be treasured. What a talented lady you are. 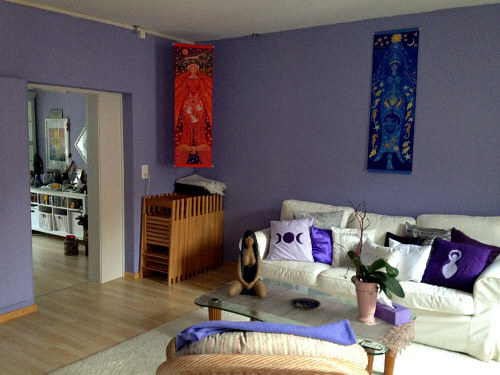 Here's a photo showing how one customer has mounted the Goddess Sabbat set...thanks Les, they look great! The print I ordered from you just two days ago has just arrived. I'm still tingling with the emotions that your paintings evoke in me. As with Morgan Le Fay (who has been on my wall since the beginning of August), Merlin has now taken up residence, too. I can't begin to tell you how excited and surprised I was when the postman handed it to me just now. Thank you so much for getting it to me so quickly. I'm thrilled with it, as I knew I would be. Thank you, also, for the beautiful cards (and note) that you sent with the picture. They will also be framed and positioned around my home, to further bring the magic alive in this house - although, it is ever-present in my heart. Wendy, thanks so very much for allowing us to enjoy your art work.. we just wanted to let you know that we received the print today in great shape..it is more breathtaking in hand then as it is on your web site. we look forward to enjoying the energy and the warmth that this art will fill our home with... we definitely will be seeking more of your art in the future as our budget allows. This order will complete my wheel of the year collection and I just wanted to let you know how much I enjoy your work. 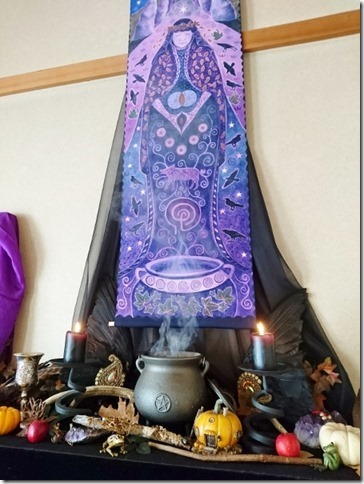 Your paintings hang above my altar, each one in turn as the seasons change, Hecate�s still there at the moment. I also wanted to thank you for your prompt service and friendly notes, its so unusual in this busy age. Some weeks ago I got the four paintings I had ordered at your website. Just to let you know that all of them arrived in perfect condition! You had packed them so caringly that not even the Spanish postmen could harm them! Thanks so much for all the wonderful postcards you sent me too! I love them all! Your artwork is of breath-taking beauty and spreading such a beautiful energy! One can feel their strong presence shifting the energy of any room immediately when hung on the wall. 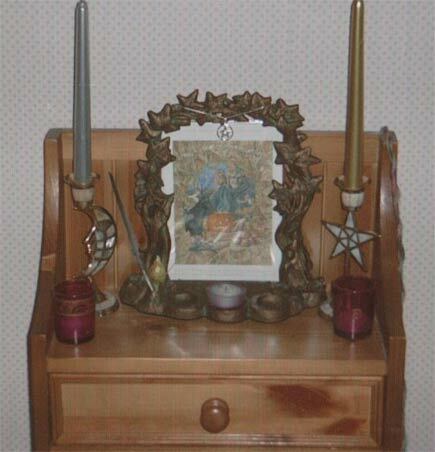 My hubby has recently sent for a set of your Goddess cards and one of your Altar frames. I just wanted to say how thrilled I am with all of them. 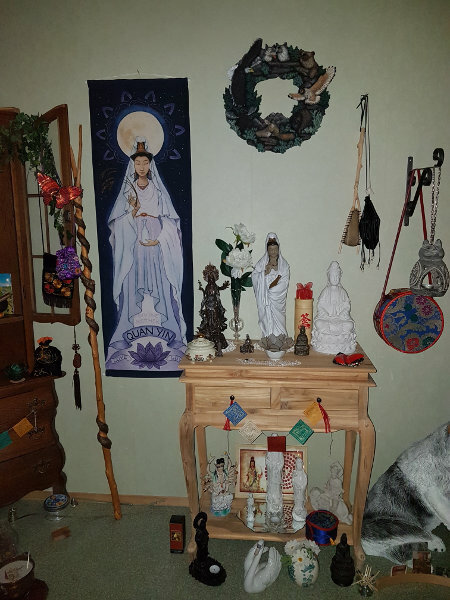 Its just what I've been looking for to complete my small sacred space. Keep up the inspiring art. Just a quick note to say thank you for the card print and yes the altar arrived safely. I've enclosed a photo. I particularly love the faeries each side.